Christology (from Greek Χριστός Khristós and -λογία, -logia), literally "the understanding of Christ," is the study of the nature (person) and work (role in salvation)[note 1] of Jesus Christ. [web 1][note 2] It studies Jesus Christ's humanity and divinity, and the relation between these two aspects; and the role he plays in salvation. From the second to the fifth century, the relation of the human and divine nature of Christ was a major focus of debates in the early church and at the first seven ecumenical councils. The Council of Chalcedon in 451 issued a formulation of the hypostatic union of the two natures of Christ, one human and one divine, "united with neither confusion nor division". Most of the major branches of Western Christianity and Eastern Orthodoxy subscribe to this formulation, while many branches of Oriental Orthodox Churches reject it, subscribing to miaphysitism. 2.2 Development of "low Christology" and "high Christology"
Christology (from Greek Χριστός Khristós and -λογία, -logia), literally "the understanding of Christ," is the study of the nature (person) and work (role in salvation)[note 1] of Jesus Christ. [need quotation to verify][web 2][web 1][note 2] It studies Jesus Christ's humanity and divinity, and the relation between these two aspects; and the role he plays in salvation. "Ontological Christology" analyzes the nature or being[web 5] of Jesus Christ. "Functional Christology" analyzes the works of Jesus Christ, while "soteriological Christology" analyzes the "salvific" standpoints of Christology. Several approaches can be distinguished within Christology. [note 3] The term "Christology from above" or "high Christology" refers to approaches that include aspects of divinity, such as Lord and Son of God, and the idea of the pre-existence of Christ as the Logos (the Word), as expressed in the prologue to the Gospel of John. [note 4] These approaches interpret the works of Christ in terms of his divinity. According to Pannenberg, Christology from above "was far more common in the ancient Church, beginning with Ignatius of Antioch and the second century Apologists." The term "Christology from below" or "low Christology" refers to approaches that begin with the human aspects and the ministry of Jesus (including the miracles, parables, etc.) and move towards his divinity and the mystery of incarnation. A basic Christological teaching is that the person of Jesus Christ is both human and divine. The human and divine natures of Jesus Christ apparently (prosopic) form a duality, as they coexist within one person (hypostasis). There are no direct discussions in the New Testament regarding the dual nature of the Person of Christ as both divine and human, and since the early days of Christianity, theologians have debated various approaches to the understanding of these natures, at times resulting in ecumenical councils, and schisms. Recapitulation theory, which says that Christ succeeded where Adam failed. Theosis ("divinization") is a "corollary" of the recapitualtion. Satisfaction theory of atonement,[note 8] developed by Anselm of Canterbury (1033/4–1109), which teaches that Jesus Christ suffered crucifixion as a substitute for human sin, satisfying God's just wrath against humankind's transgression due to Christ's infinite merit. Penal substitution, also called "forensic theory" and "vicarious punishment," which was a development by the Reformers of Anselm's satisfaction theory. [note 9][note 10] Instead of considering sin as an affront to God's honour, it sees sin as the breaking of God's moral law. Penal substitution sees sinful man as being subject to God's wrath, with the essence of Jesus' saving work being his substitution in the sinner's place, bearing the curse in the place of man. Moral government theory, "which views God as both the loving creator and moral Governor of the universe." Moral influence theory of atonement,[note 11] developed, or most notably propagated, by Abelard (1079-1142), who argued that "Jesus died as the demonstration of God's love," a demonstration which can change the hearts and minds of the sinners, turning back to God. Moral example theory, developed by Faustus Socinus (1539-1604) in his work De Jesu Christo servatore (1578), who rejected the idea of "vicarious satisfaction. "[note 12] According to Socinus, Jesus' death offers us a perfect example of self-sacrificial dedication to God." The title Kyrios for Jesus is central to the development of New Testament Christology. It is the Greek translation of Aramaic Mari, which in everyday Aramaic usage was a very respectful form of polite address, which means more than just "Teacher" and was somewhat similar to Rabbi. While the term Mari expressed the relationship between Jesus and his disciples during his life, the Greek Kyrios came to represent his lordship over the world. The early Christians placed Kyrios at the center of their understanding, and from that center attempted to understand the other issues related to the Christian mysteries. The question of the deity of Christ in the New Testament is inherently related to the Kyrios title of Jesus used in the early Christian writings and its implications for the absolute lordship of Jesus. In early Christian belief, the concept of Kyrios included the pre-existence of Christ, for they believed if Christ is one with God, he must have been united with God from the very beginning. The other early Christology is "high Christology," which is "the view that Jesus was a pre-existent divine being who became a human, did the Father’s will on earth, and then was taken back up into heaven whence he had originally come,"[web 8] and from where he appeared on earth. [note 17] According to Bousset, this "high Christology" developed at the time of Paul's writing, under the influence of Gentile Christians, who brought their pagan Hellenistic traditions to the early Christian communities, introducing divine honours to Jesus. According to Casey and Dunn, this "high Christology" developed after the time of Paul, at the end of the first centiry CE when the Gospel according to John was written. The study of the various Christologies of the Apostolic Age is based on early Christian documents. The Pauline epistles also advanced the "cosmic Christology"[note 20] later developed in the fourth gospel, elaborating the cosmic implications of Jesus' existence as the Son of God, as in Corinthians 5:17: "Therefore, if anyone is in Christ, he is a new creation. The old has passed away; behold, the new has come." Also, in Colossians 1:15: "He is the image of the invisible God, the firstborn of all creation." The synoptic Gospels date from after the writings of Paul. They provide episodes from the life of Jesus and some of his works, but the authors of the New Testament show little interest in an absolute chronology of Jesus or in synchronizing the episodes of his life, and as in John 21:25, the Gospels do not claim to be an exhaustive list of his works. Following the Apostolic Age, from the second century onwards, a number of controversies developed about how the human and divine are related within the person of Jesus. As of the second century, a number of different and opposing approaches developed among various groups. In contrast to prevailing monoprosopic views on the Person of Christ, alternative dyoprosopic notions were also promoted by some theologians, but such views were rejected by the ecumenical councils. For example, Arianism did not endorse divinity, Ebionism argued Jesus was an ordinary mortal, while Gnosticism held docetic views which argued Christ was a spiritual being who only appeared to have a physical body. The resulting tensions led to schisms within the church in the second and third centuries, and ecumenical councils were convened in the fourth and fifth centuries to deal with the issues. Although some of the debates may seem to various modern students to be over a theological iota, they took place in controversial political circumstances, reflecting the relations of temporal powers and divine authority, and certainly resulted in schisms, among others that which separated the Church of the East from the Church of the Roman Empire. In 325, the First Council of Nicaea defined the persons of the Godhead and their relationship with one another, decisions which were ratified at the First Council of Constantinople in 381. The language used was that the one God exists in three persons (Father, Son, and Holy Spirit); in particular, it was affirmed that the Son was homoousios (of the same being) as the Father. The Nicene Creed declared the full divinity and full humanity of Jesus. After the First Council of Nicaea in 325 the Logos and the second Person of the Trinity were being used interchangeably. In 431, the First Council of Ephesus was initially called to address the views of Nestorius on Mariology, but the problems soon extended to Christology, and schisms followed. The 431 council was called because in defense of his loyal priest Anastasius, Nestorius had denied the Theotokos title for Mary and later contradicted Proclus during a sermon in Constantinople. Pope Celestine I (who was already upset with Nestorius due to other matters) wrote about this to Cyril of Alexandria, who orchestrated the council. During the council, Nestorius defended his position by arguing there must be two persons of Christ, one human, the other divine, and Mary had given birth only to a human, hence could not be called the Theotokos, i.e. "the one who gives birth to God". The debate about the single or dual nature of Christ ensued in Ephesus. The First Council of Ephesus debated miaphysitism (two natures united as one after the hypostatic union) versus dyophysitism (coexisting natures after the hypostatic union) versus monophysitism (only one nature) versus Nestorianism (two hypostases). 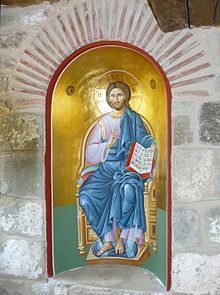 From the Christological viewpoint, the council adopted Mia Physis (But being made one κατὰ φύσιν) - Council of Ephesus, Epistle of Cyril to Nestorius, i.e. One Nature of the Word of God Incarnate (μία φύσις τοῦ θεοῦ λόγου σεσαρκωμένη mía phýsis toû theoû lógou sesarkōménē). In 451, the Council of Chalcedon affirmed dyophysitism. The Oriental Orthodox rejected this and subsequent councils and continued to consider themselves as miaphysite according to the faith put forth at the Councils of Nicaea and Ephesus. The council also confirmed the Theotokos title and excommunicated Nestorius. 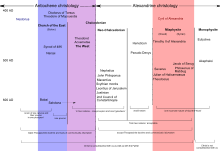 Christological spectrum during the 5th–7th centuries showing the views of the Church of the East (light blue), the Eastern Orthodox and Catholic Churches (light purple), and the Miaphysite Churches (pink). The 451 Council of Chalcedon was highly influential, and marked a key turning point in the Christological debates. It is the last council which many Anglicans and most Protestants consider ecumenical. The Council of Chalcedon fully promulgated the Western dyophysite understanding put forth by Pope Leo I of Rome of the hypostatic union, the proposition that Christ has one human nature [physis] and one divine nature [physis], each distinct and complete, and united with neither confusion nor division. Most of the major branches of Western Christianity (Roman Catholicism, Anglicanism, Lutheranism, and Reformed) and Eastern Orthodoxy subscribe to the Chalcedonian Christological formulation, while many branches of Oriental Orthodox Churches (Syrian Orthodoxy, Assyrian Church, Coptic Orthodoxy, Ethiopian Orthodoxy, and Armenian Apostolicism) reject it. Although the Chalcedonian Creed did not put an end to all Christological debate, it did clarify the terms used and became a point of reference for many future Christologies. But it also broke apart the church of the Eastern Roman Empire in the fifth century, and unquestionably established the primacy of Rome in the East over those who accepted the Council of Chalcedon. This was reaffirmed in 519, when the Eastern Chalcedonians accepted the Formula of Hormisdas, anathematizing all of their own Eastern Chalcedonian hierarchy, who died out of communion with Rome from 482-519. The Third Council of Constantinople in 681 declared that Christ has two wills of his two natures, human and divine, contrary to the teachings of the Monothelites,[web 13] with the divine will having precedence, leading and guiding the human will. The term "monastic Christology" has been used to describe spiritual approaches developed by Anselm of Canterbury, Peter Abelard and Bernard of Clairvaux. The Franciscan piety of the 12th and 13th centuries led to "popular Christology". Systematic approaches by theologians, such as Thomas Aquinas, are called "scholastic Christology". In the 13th century, Saint Thomas Aquinas provided the first systematic Christology that consistently resolved a number of the existing issues. In his Christology from above, Aquinas also championed the principle of perfection of Christ's human attributes. The Middle Ages also witnessed the emergence of the "tender image of Jesus" as a friend and a living source of love and comfort, rather than just the Kyrios image. John Calvin maintained there was no human element in the Person of Christ which could be separated from the Person of The Word. Calvin also emphasized the importance of the "Work of Christ" in any attempt at understanding the Person of Christ and cautioned against ignoring the Works of Jesus during his ministry. Catholic theologian Karl Rahner sees the purpose of modern Christology as to formulate the Christian belief that "God became man and that God-made-man is the individual Jesus Christ" in a manner that this statement can be understood consistently, without the confusions of past debates and mythologies. [note 22] Rahner pointed out the coincidence between the Person of Christ and the Word of God, referring to Mark 8:38 and Luke 9:26 which state whoever is ashamed of the words of Jesus is ashamed of the Lord himself. Hans von Balthasar argued the union of the human and divine natures of Christ was achieved not by the "absorption" of human attributes, but by their "assumption". Thus, in his view, the divine nature of Christ was not affected by the human attributes and remained forever divine. The Nativity of Jesus impacted the Christological issues about his Person from the earliest days of Christianity. Luke's Christology centers on the dialectics of the dual natures of the earthly and heavenly manifestations of existence of the Christ, while Matthew's Christology focuses on the mission of Jesus and his role as the savior. The salvific emphasis of Matthew 1:21 later impacted the theological issues and the devotions to Holy Name of Jesus. Matthew 1:23 provides a key to the "Emmanuel Christology" of Matthew. Beginning with 1:23, Matthew shows a clear interest in identifying Jesus as "God with us" and in later developing the Emmanuel characterization of Jesus at key points throughout the rest of his Gospel. The name Emmanuel does not appear elsewhere in the New Testament, but Matthew builds on it in Matthew 28:20 ("I am with you always, even unto the end of the world") to indicate Jesus will be with the faithful to the end of the age. According to Ulrich Luz, the Emmanuel motif brackets the entire Gospel of Matthew between 1:23 and 28:20, appearing explicitly and implicitly in several other passages. The accounts of the crucifixion and subsequent resurrection of Jesus provides a rich background for Christological analysis, from the canonical Gospels to the Pauline Epistles. A central element in the Christology presented in the Acts of the Apostles is the affirmation of the belief that the death of Jesus by crucifixion happened "with the foreknowledge of God, according to a definite plan". In this view, as in Acts 2:23, the cross is not viewed as a scandal, for the crucifixion of Jesus "at the hands of the lawless" is viewed as the fulfilment of the plan of God. The threefold office (Latin munus triplex) of Jesus Christ is a Christian doctrine based upon the teachings of the Old Testament. It was described by Eusebius and more fully developed by John Calvin. It states that Jesus Christ performed three functions (or "offices") in his earthly ministry – those of prophet (Deuteronomy 18:14–22), priest (Psalm 110:1-4), and king (Psalm 2). In the Old Testament, the appointment of someone to any of these three positions could be indicated by anointing him or her by pouring oil over the head. Thus, the term messiah, meaning "anointed one", is associated with the concept of the threefold office. While the office of king is that most frequently associated with the Messiah, the role of Jesus as priest is also prominent in the New Testament, being most fully explained in chapters 7 to 10 of the Book of Hebrews. Some Christians, notably Roman Catholics, view Mariology as a key component of Christology. [web 16] In this view, not only is Mariology a logical and necessary consequence of Christology, but without it, Christology is incomplete, since the figure of Mary contributes to a fuller understanding of who Christ is and what he did. Joseph Cardinal Ratzinger (later Pope Benedict XVI) expressed this sentiment about Roman Catholic Mariology when in two separate occasions he stated, "The appearance of a truly Marian awareness serves as the touchstone indicating whether or not the Christological substance is fully present" and "It is necessary to go back to Mary, if we want to return to the truth about Jesus Christ." rising from the dead of all men. * Docetism is the doctrine that the phenomenon of Jesus, his historical and bodily existence, and above all the human form of Jesus, was mere semblance without any true reality. Broadly it is taken as the belief that Jesus only seemed to be human, and that his human form was an illusion. Docetic teachings were attacked by St. Ignatius of Antioch and were eventually abandoned by proto-orthodox Christians. * Arianism viewed Jesus as primarily an ordinary mortal was considered at first heretical in 325, then exonerated in 335 and eventually re-condemned as heretical at the First Council of Constantinople of 381. * Nestorianism opposed the concept of hypostatic union, and emphasizes a radical distinction between two natures (human and divine) of Jesus Christ. It was condemned by the Council of Ephesus (431), and Monophysitism by the Council of Chalcedon (451). ^ The "ransom theory" and the "Christ Victor" theory are different, but are generally considered together as Patristic or "classical" theories, to use Gustaf Aulén's nomenclature. These were the traditional understandings of the early Church Fathers. 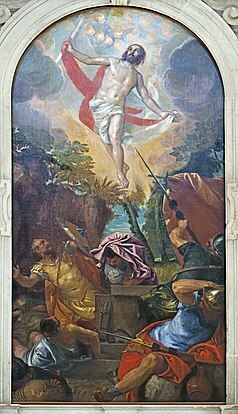 ^ Early Christians found themselves confronted with a set of new concepts and ideas relating to the life, death, and resurrection of Jesus, as well the notions of salvation and redemption, and had to use a new set of terms, images, and ideas in order to deal with them. The existing terms and structures which were available to them were often insufficient to express these religious concepts, and taken together, these new forms of discourse led to the beginnings of Christology as an attempt to understand, explain, and discuss their understanding of the nature of Christ. Early Jewish Christians had to explain their concepts to a Hellenistic audience which had been influenced by Greek philosophy, presenting arguments that at times resonated with, and at times confronted, the beliefs of that audience. This is exemplified by the Apostle Paul's Areopagus sermon that appears in Acts 17:16–34, where Paul is protrayed as attempting to convey the underlying concepts about Christ to a Greek audience. The sermon illustrates some key elements of future Christological discourses that were first brought forward by Paul. ^ Witherington: "[Christ’s Divinity] We have already seen that Paul, in appropriating the language of the christological hymns, subscribed to the christological notion that Christ existed prior to taking on human flesh. Paul spoke of Jesus both as the wisdom of God, his agent in creation (1 Cor 1:24, 30; 8:6; Col 1:15–17; see Bruce, 195), and as the one who accompanied Israel as the ���rock” in the wilderness (1 Cor 10:4). In view of the role Christ plays in 1 Corinthians 10:4, Paul is not founding the story of Christ on the archetypal story of Israel, but rather on the story of divine Wisdom, which helped Israel in the wilderness." ^ Proponents of Christ's deity argue the Old Testament has many cases of Christophany: "The pre-existence of Christ is further substantiated by the many recorded Christophanies in the Bible." "Christophany" is often[quantify] considered a more accurate term than the term "theophany" due to the belief that all the visible manifestations of God are in fact the preincarnate Christ. Many argue that the appearances of "the Angel of the Lord" in the Old Testament were the preincarnate Christ. "Many understand the angel of the Lord as a true theophany. From the time of Justin on, the figure has been regarded as the preincarnate Logos." ^ Loke (2017): "The last group of theories can be called 'Explosion Theories' (one might also call this 'the Big-Bang theory of Christology'!). This proposes that highest Christology was the view of the primitive Palestinian Christian community. The recognition of Jesus as truly divine was not a significant development from the views of the primitive Palestine community; rather, it 'exploded' right at the beginning of Christianity. The proponents of the Explosion view would say that the highest Christology of the later New Testament writings (e.g. Gospel of John) and the creedal formulations of the early church fathers, with their explicit affirmations of the pre-existence and ontological divinity of Christ, are not so much a development in essence but a development in understanding and explication of what was already there at the beginning of the Christian movement. As Bauckham (2008a, x) memorably puts it, 'The earliest Christology was already the highest Christology.' Many proponents of this group of theories have been labelled together as 'the New Religionsgeschichtliche Schule ' (Hurtado 2003, 11), and they include such eminent scholars as Richard Bauckham, Larry Hurtado, N. T. Wright and the late Martin Hengel." ^ The concept of "Cosmic Christology", first elaborated by Saint Paul, focuses on how the arrival of Jesus as the Son of God forever changed the nature of the cosmos. ^ a b c Ehrman 2014, p. 108. ^ a b c Ehrman 2014, p. 171. ^ a b O'Collins 2009, p. 1-3. ^ a b c Ramm 1993, p. 15. ^ a b c d Bird, Evans & Gathercole 2014, p. 134, n.5. ^ a b Ehrman 2014, p. ch.6-9. ^ a b Davis 1990, p. 342. ^ a b c d Armentrout & Boak Slocum 2005, p. 81. ^ a b c Espín & Nickoloff 2007, p. 217. ^ a b c Beversluis 2000, p. 21–22. ^ Brown 1994, p. 3. ^ a b c O'Collins 2009, p. 16-17. ^ a b c d e Brown 1994, p. 4. ^ a b Pannenberg 1968, p. 33. ^ O'Collins 2009, p. 16. ^ a b c Ehrman 1993. ^ a b c McGrath 2007, p. 282. ^ Weaver 2001, p. 2. ^ Beilby & Eddy 2009, p. 11-20. ^ Pugh 2015, p. 1. ^ Pugh 2015, p. 1, 26. ^ a b Taylor 1956, p. 71-72. ^ a b Packer 1973. ^ Beilby & Eddy 2009, p. 17. ^ Weaver 2001, p. 18. ^ Beilby & Eddy 2009, p. 18. ^ Weaver 2018, p. 18. ^ a b c d McGrath 2006, p. 137–41. ^ a b c d Grillmeier & Bowden 1975, p. 15. ^ a b c Witherington 2009, p. 106. ^ a b Ehrman 2014, p. 125. ^ a b Loke 2017, p. 3-4. ^ Loke 2017, p. 4. ^ Loke 2017, p. 4-5. ^ a b c d e Loke 2017, p. 5. ^ Bauckham 2011, p. 110-111. ^ Loke 2017, p. 6. ^ a b Gerald 2009, p. 1-3. ^ Ehrman 2014, p. 113. ^ a b c Grillmeier & Bowden 1975, p. 15–19. ^ O'Collins 2009, p. 142. ^ a b Fahlbusch 1999, p. 463. ^ a b Rausch 2003, p. 149. ^ a b Price & Gaddis 2006, p. 1–5. ^ O'Collins 2009, p. 208–12. ^ Dunn 2003, p. ch.4. ^ O'Collins & Kendall 1996, p. 30-31. ^ Rahner 2004, p. 755–67. ^ Grillmeier 1975, p. 755. Wolfhart Pannenberg, Systematic Theology, T & T Clark, 1994 Vol.2. ^ a b Larry Hurtado, The Origin of “Divine Christology”? ^ a b c d Ehrman, Bart D. (14 February 2013). "Incarnation Christology, Angels, and Paul". The Bart Ehrman Blog. Retrieved 2 May 2018. ^ Larry Hurtado (July 10, 2015 ), "Early High Christology": A "Paradigm Shift"? "New Perspective"? ^ a b c Bouma, Jeremy (27 March 2014). "The Early High Christology Club and Bart Ehrman — An Excerpt from "How God Became Jesus"". Zondervan Academic Blog. HarperCollins Christian Publishing. Retrieved 2 May 2018.